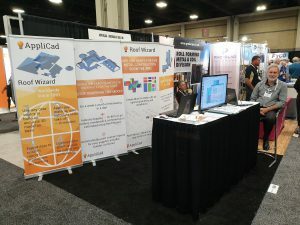 AppliCad / News / Hello from #METALCON18 in Charlotte, North Carolina! “The METALCON18 show has started and we’re all set for a great show. They have had a damp start here. Hurricane Florence dumped metres of rain on the whole area last month with record floods, a significant separate storm system dumping rain on us now. With hurricane Michael about to cross the Florida Pan Handle about midday today with the resultant storm passing us as it crosses the country and on into the Atlantic over the next couple of days, we’re wet and going to stay wet! Come and see us at METALCON18, Booth 926 tomorrow!